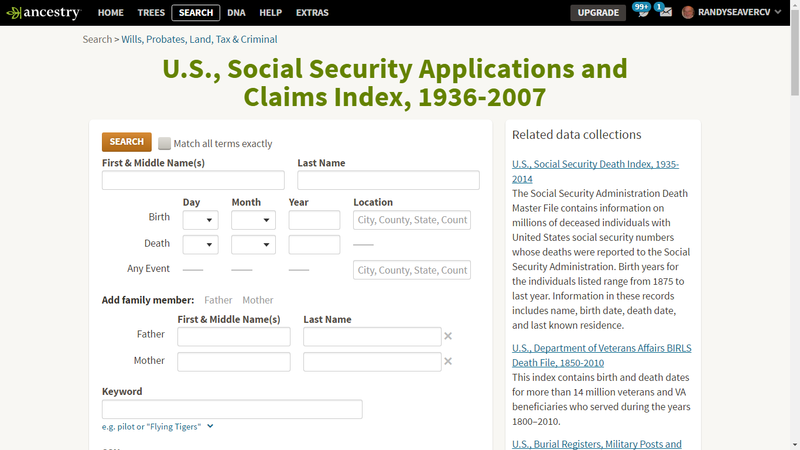 One of my favorite digitized record collections is the U.S., Social Security Applications and Claims Index, 1936-2007, which is found only on Ancestry.com at this point in time. You may also find details on changes made to the applicant's record, including name changes or information on claims that were recorded. The most common types of claims noted include: Original SSN (when the original application was submitted to obtain a SSN), Life Claim (when a claim was made for disability or retirement benefits), Death Claim (when a claim was made by a surviving family member for death or survivor benefits), and Duplicate SSN (usually used when an application was made to replace a SS card, it may also indicate a change in SSN or that more than one SSN was assigned). There is much more information on the database page, including reasons why a person might be in this collection, why some parents names may not be provided, etc. This record provides a Social Security Number, which I did not know before (she applied for benefits on her husband's SS). It provides a birth and death date. It provides her parents names. The Note indicates that the original application was made in January 1943 (probably when she started work at Rohr Aircraft in Chula Vista after her marriage in July 1942). In some cases, the Note will list every name that a person used - for women, it may be her maiden name, her married name with each spouse, etc. 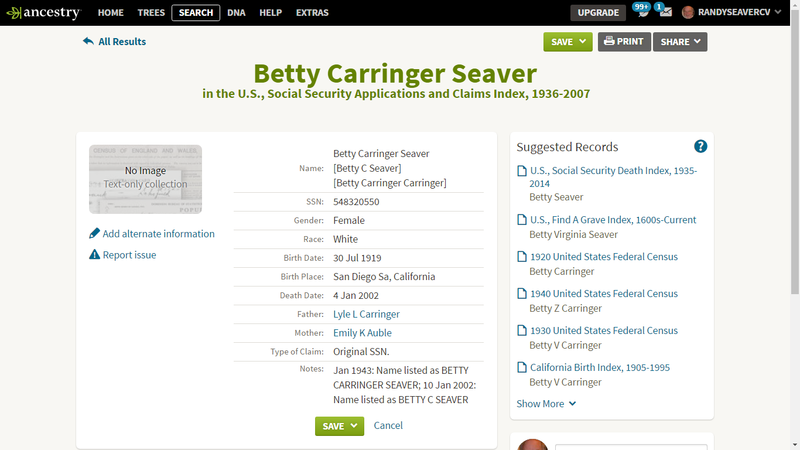 This record collection has provided information, especially for birth date and place, parents names and alternate names, for many persons in my RootsMagic database. While this is an index, and as such it is a Derivative Source, with Secondary Information, but it is Direct Evidence for the names, dates and places. It may provide a clue to the researcher for birth, marriage and death records. While there is no record image, an image of the Social Security application can be ordered for a fee from the Social Security Administration. 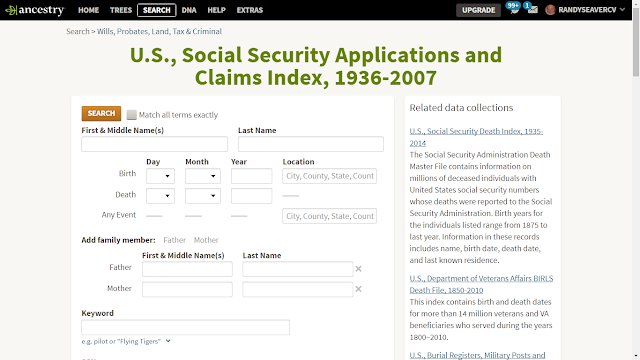 Unfortunately, not every person who had a social security number is included in this index - for instance, my father is not, nor are my Carringer grandparents, but they all were in the Social Security Death Index and drew benefits. This record collection is only on Ancestry.com and is not on FamilySearch, Findmypast, MyHeritage or any other record provider, to the best of my knowledge. I agree with you that this is one of the best collections ancestry has, for all the reasons you mentioned. One other thing is the name changes at the bottom. For women, it gives you a general idea of her name changes, thus marriages, divorces and re-marriages. The dates of the changes give a hint of when a marriage etc took place. Thanks for pointing out this important index. Also a favorite of mine Randy.